Former Arizona Sheriff Joe Arpaio refuses to die out of the news cycle. In addition to running to represent the state in the U.S. Senate despite having been convicted of a crime, Arpaio seems insistent on dying on the hill of racism. He recently swore to resume his already debunked conspiracy theory surrounding President Barack Obama’s birth certificate if he is elected to the Senate. As we know, this is not Arpaio’s first round at the racist rodeo. As sheriff of Maricopa County, Ariz., he was charged with criminal contempt and found guilty of ignoring a judge’s order to stop profiling Latinx people in his signature immigration patrols. He also has a recorded history of making inmates in his jails wear pink underwear and sleep outside in tents during the sweltering Arizona summers, as well as other inhumane treatment. Of course, since he’s a white man, his criminal history was dismissed, thanks to y’all’s dusty president, who gave him a presidential pardon. A federal judge then took it a step further, accepting the pardon and dismissing Arpaio’s guilty verdict with prejudice, meaning that the case can never be tried again. And so here we are, with a soulless, corrupt bully running for the Senate who is already promising to continue a witch hunt against the country’s only black president. 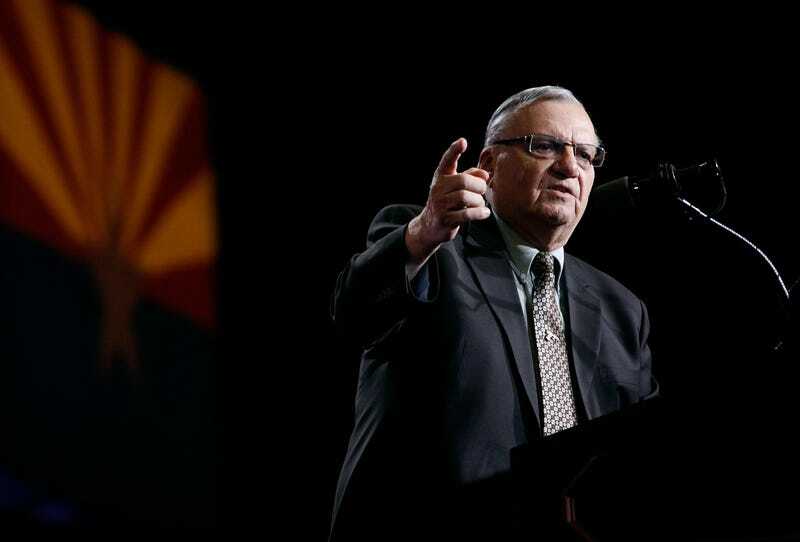 According to Newsweek, Arpaio brought up the conspiracy once again while speaking to a room of supporters at the Western Conservative Conference in Phoenix over the weekend. This is, of course, not the first time Arpaio has rekindled his Birtherism claim; his previous attempt at crying wolf was earlier this year on CNN, shortly after he announced his Senate candidacy. It seems like the old windbag will expel his last breath spouting his lies.